Removal of free and dissolved water. Removal of oil degradation products. Heating of the transformer and its core with hot oil. Removal of sediment from the coils of the transformer. The principle of processing the dielectric oil is heating the oil and passing it through a vacuum vessel. The heat and low pressure reduce partial pressure of water and gases in the oil. This facilitates evaporation of water and emission of gases and their removal. Degradation products are removed by sorbent (Fuller’s earth. 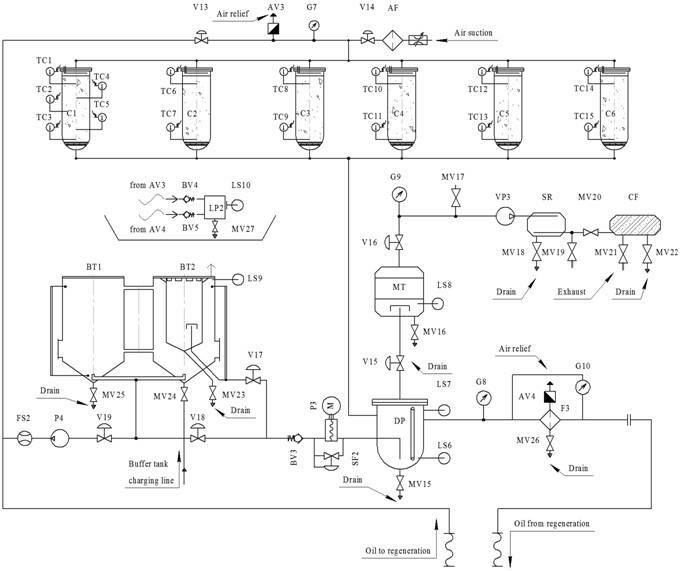 The oil is directed to vessels, containing the sorbent. When the oil contacts the sorbent, the oil is filtered on molecular level. The oil’s chemical and physical properties are thus restored. Sorbent is reactivated in the Sorbent reactivation mode. This method allows reusing the sorbent without the need to replace it. Connection of the unit’s inlet and outlet to an oil vessel and circulating the oil in the vessel. 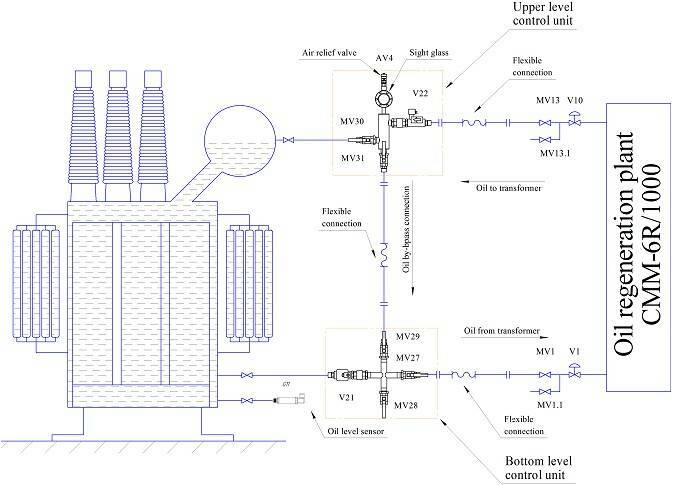 Connection of the unit’s inlet and outlet to a transformer and circulating the oil in the transformer. Connection of the unit’s inlet to an oil vessel, and connection of the outlet to a transformer. Connection of the unit’s inlet to one oil vessel and the unit’s outlet to another oil vessel. For evacuation of transformer or other equipment, the unit is equipped with a vacuum evacuation port. The unit consists of two primary operating sections: the degasser and the regeneration section. These sections are interconnected by pipelines. The unit is optionally equipped with a system to control oil level in the transformer, the TSS (Transformer Security System). The unit is controlled by an industrial PLC controller, which is programmed for operation and control of the unit’s components. Automation and electric control system consists of two power cabinets and a control cabinet. Power cabinet is installed directly on the unit’s frame. The cabinet contains communication equipment: magnetic starters, motor protection automation, heating power control section and automatic switches (circuit breakers), while the control cabinet contains the controller with a number of digital and analogue inputs and outputs. Automatic protection of motor drives (Q1 – Q6) are installed for protection of the motor from current overloads and short circuits. The magnetic starters (КМ2 – КМ7) move the drives in accordance with the logic programmed in the controller. The power of electric heater is controlled by a solid state relay and depends on the current throughput and temperature set by the operator. The heaters are protected from short circuit by a triplepole switch. The control cabinet is located in the operator room and contains power supply, reducing transformers, power supply filter and automatic protection. The front panel contains power supply and phase control lights, emergency stop button and the control touch panel. The control system is based on a controller and a touch panel. The controller contains a set of instructions to control the logic of actuator operation. The touch panel is a device for display and control. 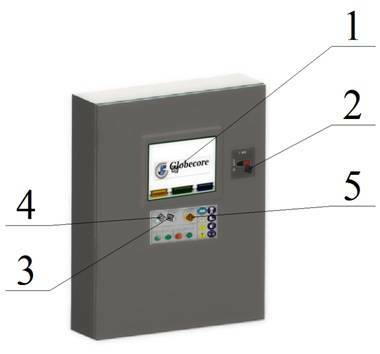 The panel allows the operator to view main parameters, such as the temperature, pressure, vacuum and throughput, as well as the status of actuators. The panel is also a means to control the processes in the controller’s memory. «СHARGING» mode – filling the unit. In this mode, the vessels of the unit are filled to the maximum level, and air is released from pipelines. 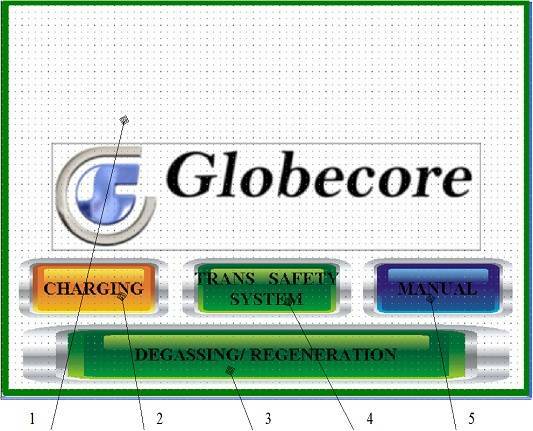 Oil degassing Moisture, gases and solids are removed from transformer oil in this mode. Oil regeneration Oil is regenerated and degassed in this mode. Sorbent properties are restored in this mode. All contaminants within the sorbent are burned out, those that cannot be burned out are collected in waste trap. While this mode is active, the unit continues to degas the oil in the transformer. Equipment testing and adjustment mode: «MANUAL». All components of the unit may be turned on or off in this mode. V1 Automatic oil inlet valve Stops oil flow into the unit. P1 Centrifugal pump Pumps oil into the unit. LS4 Oil level sensor Shows oil level in trap. Stop the unit if the level of oil in the trap exceeds acceptable level. MF2 Mesh filter Protects oil level control system from contamination. V10 Automatic ball valve Stops oil output from the unit. MV 13 ; MV 13.1 Ball valves Stop oil input to the unit. LS6 Level sensor Indicates oil presence in the bottom of intermediate tank. MV19 Ball valve Vacuum system exhaust valve. Used for direct exhaust bypassing charcoal filter CF. BT Buffer tank Oil tank. Used for adding oil to the unit and collection of condensate. LS9 Level sensor Limits oil level in the buffer tank. 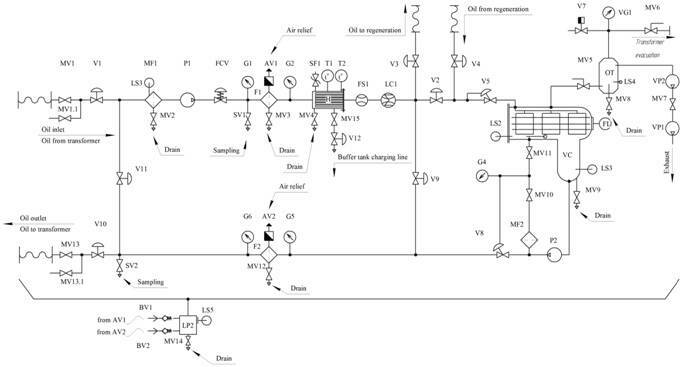 FS2 Flow relay Registers oil flow during refilling of the unit with oil.